A series of linear parks parallels some of Moscow’s main roads, forming an inner ring around the central part of the city. This is a great 10.5 km loop, very easy to follow, passing by some of the city’s main sites through several small parks and squares, with some roads/sidewalks connecting them. Metro stops line the whole route, so you can easily modify the route/distance. Start at the Kropotkinskaya metro, next to the Cathedral of Christ the Saviour. 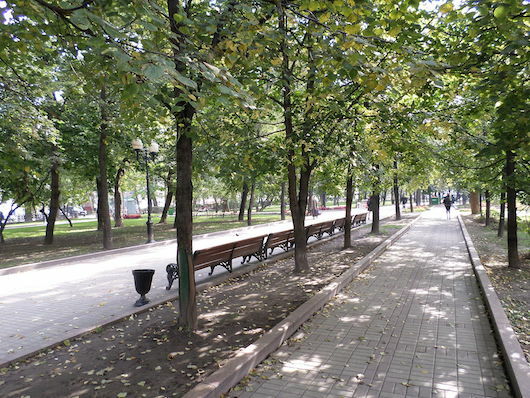 Run through the park, by the Sholokhov Monument and the chess museum, paralleling Gogolevsky Blvd. Cross New Arabat Ave., passing by the The State Museum of Oriental Art, Gogol House on the left, into the next park, paralleling Nikitsky Blvd. Run by the “Alexander and Natalie” rotunda, and into the next linear park, by the Timiryazev Monument, now along Tverskoy Blvd. following a series of parks for 2 km, passing by the Nativity Church, monuments to Rachmaninov and Vysotsky, to the Moscow Museum of Modern Art (take a quick jaunt up to the Hermitage Garden for a nice detour). The next section is along Petrovsky Blvd., passing the landmark Vysoko-Petrovskiy Monastery. Run for 2 km, through a small park with the Krupskoy monument, and then another 1 km through a lovely park with a nice pond, paralleling Chistoprudny Blvd. Run past the Chernyshevsky monument, and into another park paralleling Pokrovsky Blvd., to the Bolshoy Ustyinskiy Bridge. The final 2.5 km is west along the river path, or through Zaryadye Park. You can add here with the river embankment paths, and elements of our ‘Red Square’ tour. Add-On: At the northern end of the run, a 3 km one-way linear park heading north toward the 3rd Ring Road from the Trubnaya metro stop. Landmarks include the Nikulin Moscow Circus, several monuments, Yekaterininskiy Park, the Central Armed Forces Museum, and the Museum Tapan. 10.6 km (6.6 mile) loop; 3 km add-on out to Third Ring Rd.